Before I end making another dramatic post, let me share a new venue which my employer chose for an important corporate meeting. Having been working in Manila for a decade, I have witnessed how Luneta Hotel transformed. I initially saw it as one of the old and dilapidated buildings in Manila. Years ago, this was how Luneta Hotel looked like. I was one of those who were secretly hoping that the building will someday be resurrected. Problem is, with the high rise condominium and the nearby five-star hotels, it's hard to convince a company to take a chance to Luneta Hotel. The heavens have heard the prayers of old souls like me. It was gradually restored. At first, I thought that the new developer will demolish or have it converted to an office or business establishment. When I later discovered that it will return as a real hotel, I was one of the happiest. The restoration didn't come easy. I learned that it took the new owner 7 years to get all the job done. 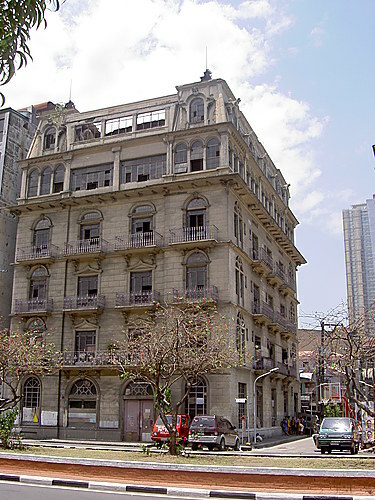 Good as, there have been efforts to restore the hotel ever since I started working in Manila. What greeted me as soon as I entered the premises of the hotel. A set of gilded chairs, which I learned used to be restricted for guests. These used to be mere decorative pieces. I love this sculpture from Benguet. We stayed at the 6th floor, which houses the grandest function room of the hotel. This was my workplace for two days. Originally, it costs Php 50,000 to have this venue for 4 hours. The cost already includes consumable food and drinks. But after some negotiations, we were given a considerable discount. :) If you share the same job with me, you might want to consider this venue for meetings to Christmas parties. You can look for their very accommodating and organized Operations Manager, Ms. Bel Ricablanca. Even the front desk service officers (Hello Keith and Kevin!) are the best. I never had problems coordinating with them. I never got to sit in the grand table and chair. This was my place. I love the doors that either lead to the storage room or staircase. It felt like a setting in a fairy tale. I also learned that the wall tiles were part of the original flooring of the old hotel. One of the highlights of the function hall is this modest fountain. The windows behind provide a great view of Manila's skyline. While I don' have photos of the food, I have to say that it was worth the price. Everything served to us were tasty, delicious and offered assortment of Filipino, America to Italian dishes. Even the amount of servings is abundant. Food was never a problem and so as customer service with the cook and waiters. Their food can equate to the quality of five star hotels. For more information about Luneta Hotel, check out their website here. There goes my dream to own that hotel. When S was a newborn, we were always going to UST for checkups and vaccinations and l always stared longingly at that structure, hoping it would be mine and then restore it. I already planned on living on the topmost floor, leaving the other floors for business. Sarap mangarap. Wow, that hotel really made quite the transformation! I hope, despite the extra work, that you are enjoying this additional responsibility, Diane. I do hope your boss(es) recognize what a good job you are doing. I was so delighted to hear from you, Diane. Your sweet comments and your prayers mean so much. Chemotherapy is going very well, and I have not suffered through many of the usual side-effects except for exhaustion. I have been so overwhelmed with the response from my blog friends and so has my hubby. The day I received 3 packages in the mail, all from bloggers, my hubby smiled at me and told me how glad he is that I have such an amazing support group. He used to think blogging was kind of a waste of time, but not any more! I will be happy to count you as one of my "cheerleaders." I will also try harder to connect with you more often and see what's going on in your life. It such a beautiful hotel and i am so enjoying here. I've stayed at Lunda Pensionat twice (so far). Lunda Pensionat is a pretty small place on a quiet street in Södermalm. The location is very good, with a T-bana stop very close to the hostel. I found the hostel very quiet, pleasant and clean. Ngaun ko lang nalaman na may Luneta Hotel pala. So hindi ko pa talaga nasusuyod ang buong kamaynilaan kahit na sa Manila naman ako pinanganak. Thanks for sharing, D! Ang ganda ng interiors nya; and parang it will transport you back to another era. I-suggest ko nga ito sa office namin, we should have our conferences here para may kasama nang tour sa loob hehe! I never knew that there was a Luneta Hotel at ang gandaaa! Good for ilang pax ung P50k 4 hours? Wow, this is so adorable venue. I love this Luneta Hotel. Thanks a ton for the photographs and reviews. Last year I celebrated NYE at local convention center but this year I would love to book this Hotel for my company NYE party.